Lynskey Pro GR vs Ibis Hakka MX - thoughts? Thread: Lynskey Pro GR vs Ibis Hakka MX - thoughts? I'm contemplating a gravel bike for my next "road" bike and as an alternative to taking the hardtail out. The Lynskey Pro GR is interesting and currently on sale, though I have a lot of happy miles with Ibis mountain bikes, so the Hakka MX might be a good choice. My use case would be a combination of steep fire roads (up or down) and road riding, probably mixed at least a bit in each ride. I'd plan on getting two wheelsets and would want to use the widest spread of gear ratios I could possibly get away with. Bikepacking-friendliness would be a minor plus - I'd like to try it at some point down the road, but not sure I have the time and energy to follow, so I'm filing that under "would be nice, but not critical". One dark horse option would be to save the money and build up a Niner Air 9 RDO frame I have as a monstercross set up. I prefer a relaxed steering geometry, so I don't think the geo would necessarily be a dealbreaker there. Personally I think a gravel bike should have compact geometry, so I would choose the Lynskey PRO GR. Plus, it looks to be a lot more interesting with the rectangular tubing. And the sale price (at nearly half price) is reasonable. I'd go with the 105 hydraulic (+$200) and leave the the rest of the setup 'standard'. That said, I'd prefer not having to make a quick decision based upon a sale price. Thanks for the reply. It's definitely interesting, but tough to decide on short notice. Also doesn't help that I'm smack dab in between M and ML sizes at 5'8 1/2". If I could fit a subcompact road crank on my Niner frameset it might just work for me and would actually weigh at least a pound lighter. The issue at that point would be if the shorter stem/longer reach would make it twitchier on the road than the relaxed head angle could offset. Your choice of handlebar and tire size has a far greater impact than stem angle/length as regards handling. I'd look into your documentation and see what the chainline is intended to be and what the maximum ring size is. This sounds like a fun MCX build in the offing IMHO. Especially since you already have the frame. The issue with the Hakka I see...is that for whatever reason they chose to CX mount the bottle cage on the seat tube, rather than up higher as you would for a road(ish) bike. Which means you will probably need to shim the cage to clear the FD clamp if you 2x it. Also it has a steeper HT angle compared to the Lynskey and slightly shorter chainstays. Any of these could make a fun ride, the devil is in the details. 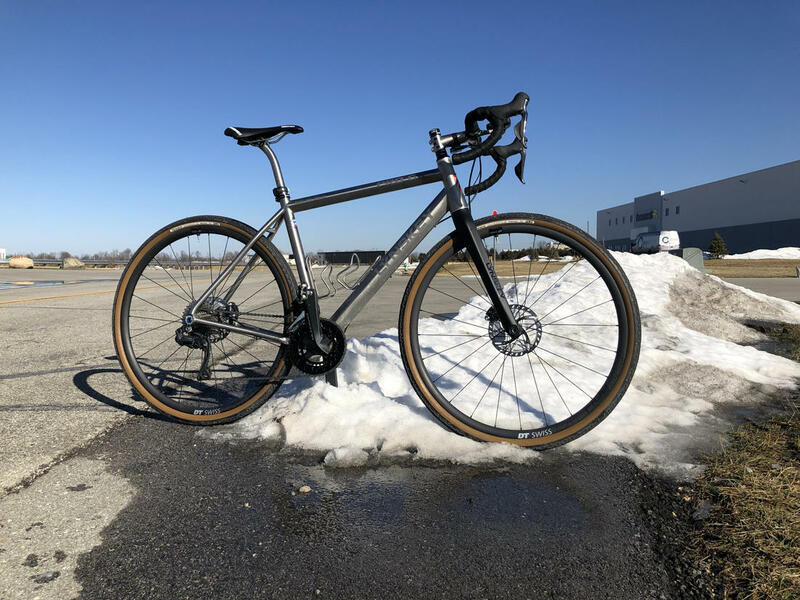 I looked at the Litespeed and Lynskey as my primary choices for a Ti gravel bike. I received the Pro GR the first of the year. I'm very happy with it. The frame workmanship is top notch. Watch Lynskey's site for discounts. When I got mine I was able to get a 30% discount. They run 20% quite often. My only beef with the design is the rear brake cable being exterior. Both from a cleaning and aesthetics issue, I wish they'd developed a way to make it internal. Its winter here in Indiana. As such, I' only have two legitimate gravel rides and a few urban rides on it to date. Ride and handling are very good. Have a look and Honey bikes, sounds like what you want is right up their alley. Specifically the All Roads and CX Utility. All roads is steel or Ti but I think the CX Utility is still only in steel. In case you didn't know: Honey is essentially non-custom Seven. They make a ton of sizes though so fit should be no problem. Downside is they are made to order to you have a wait. I think it was about a month for mine. I wasn't clear if you are looking for a full bike or a frame. Honey does offer just frame. I suggest them instead of Seven or other custom because I assumed budget. Exactly what you're looking for would be a no-brainer for Seven and several other custom builders. Curious - why the PRO GR and not the GR 270? I ask because I'm awaiting delivery of a GR270 sometime in the next couple of weeks (fingers crossed). I didn't go with the PRO because I had a Seven Ti bike 15 yrs ago that was way too stiff and dead feeling - so I opted for what I'm guessing is the springier GR frame, even though I'm 190 lbs. I went with the Litespeed GRAVEL. Titanium is the perfect material for a gravel bike. Strong, light and DURABLE. NO worry about rocks bouncing of the frame, crashing or the bike falling over. I did ultegra di2 but I may get rid of it due to too many problems. I have two sets of wheels one for road one for off-road with tires mounted and cassette on both and I love this. I put 27.5x2.1 tires on my I9 offroad wheels love it. Good riding to us all!